When most people picture "scotch whiskey" as an archetype they are thinking of a malt sweet spirit with a floral sherried nose, a golden yellow color, and some oak in the finish. Blends such as Johnny Walker and Chivas mix many malts (and varying amounts of spirit fillers to get at this ideal with clock-like consistency. There are a number of pure single malts that embody this ideal, from Macallan to Glenlivet. Most tend to be Speyside malts. The limpid marble waters and sweet grain of the region exemplify scotch whiskey. 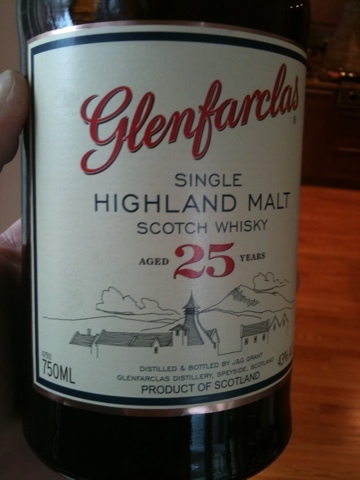 None, however nails the archetype's lightness, floral sweetness, and consistent mix of attributes more or more consistently than Glenfarclas. Glenfarclas has an extensive line from moderately young to extremely old that are all clear kin and utterly archetypical Speyside scotch - every single one. The sweet heart of the line are the 17 (perfect) and 21 (just a kiss older and richer than perfect) year old expressions. Today I'm drinking the 25 year expression. Is it gilding the lilly? Does the extra age ruin the magic with too much wood or is it even a scooch better yet? Color: Light amber gold. Just like "scotch" looks in the dictionary picture. Nose is Sweet vanilla sherry - simple "Scotch" - increasingly rich with time. Toffee malt richness turns the aroma ambrosial with time (lots of time) in the glass. Light mouthfeel. The entry is mostly sweet with straight malt sugars. Expansion is broad but light and floral with vanilla from oak tannins which bring a pepperiness and a dryness in the texture. Sherry and nougat and cake frosting flavors round into red fruits (cherry and red plum) as the midpalate blooms into honeyed splendor. Finish is sweet turning tannin dry with a long tail of vanilla and honeysuckle and citrus (tangerine) that ends on a slightly bitter note. This is clearly kissing cousins with the 21 but there is a little more of everything... including that bitterness at the end. Personally I'd stand pat with the 21, but I can see why the distiller pushed it. There is definitely a perspective that the 25 delivers that is valid and delicious - just I feel the balance of attributes is best with the 21. You might feel differently. None of these Glenfarclases are big intense flavors. All are gentle, sweet, and polite. It's what Chivas dreams of when it dreams of scotch.